Would you believe you can lose weight and change your life for the better in only three weeks? Living life to its full potential includes fueling your body in a healthy way. Your body relies on natural, whole foods for energy. Processed foods are difficult for the body to digest, and don’t provide the nutrition your body needs to thrive. Many aren’t even real foods at all! In order to maximize weight loss and regain your natural vitality, you must first rid your body of the “junk” that is left behind. During this phase, you’ll retrain your metabolism and improve digestion by focusing on real foods. For these three weeks, you’ll eat only fruits and vegetables and follow the supplement program provided by Dr. McCleery. You won’t be eating meat, fish, eggs or cheese, and you’ll need to stay away from coffee and alcohol. Many patients report losing as much as seven to twelve pounds over the course of these three weeks, and they feel better than ever. After the first three weeks, you’ll begin adding certain foods back into your diet. Fresh fish and organic produce will be the staples of your diet. 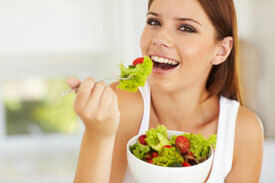 Your body will once again be able to digest real foods more efficiently. Dr. McCleery uses the Standard Process® brand of supplements with his patients. The Standard Process® Purification Program provides a helpful shopping list, smoothie recipes, vitamins and nutrients to help you achieve the greatest results from the program. Dr. McCleery offers a large selection of Standard Process® products to meet the varying needs of his patients. Have questions? Check out our FAQ or simply contact our office today to find out how you can get started.